UNIVERSITY PARK, Pa. — Using their small family-owned and operated business, Penn State alumni Larry and Anne Barasch launched a fundraiser to sell the now famous “Stronger Than Hate” t-shirts following the tragic shooting at the Tree of Life synagogue in Pittsburgh last October. Larry, a Blue Band alumnus who holds a bachelor’s degree in architecture and master’s degree in architectural engineering from Penn State, and his wife, Anne, an alumna of the College of the Liberal Arts, are the owners of 123shirt.com, a custom clothing company in Pittsburgh. 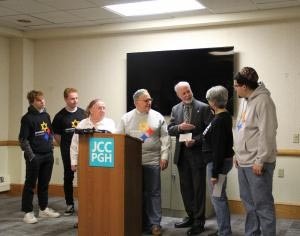 On October 27, 2018, the Squirrel Hill neighborhood lost 11 community members after an anti-Semitic gunman entered the Tree of Life synagogue and opened fire during that morning’s Shabbat services. That night, the small business, run by Larry, Anne and their son David, also a Penn State alumnus, began selling the shirts with the now-iconic emblem. Local Pittsburgh artist Tim Hindes created the image — the traditional Steelers logo with the yellow diamond replaced by a Star of David. The Barasch family decided all proceeds after costs from the shirts would be donated to the funds established by the three congregations impacted by the shooting, which all worshipped at Tree of Life: Tree of Life, Dor Hadash and New Light. Just two months after sales began, the Barasch family, on behalf of the thousands of people worldwide who purchased shirts, donated their first payment of $18,000 — a multiple of the number 18, or chai, which in the Jewish faith represents giving “the gift of life.” This donation, made on December 28, 2018, was given in honor of Larry’s uncle, 80-year-old Judah Samet, whose life was likely saved by being late to synagogue that day. Judah Samet arrived at the Tree of Life synagogue four minutes after the shooting began to find the gunman exchanging fire with the first police officers on the scene. Samet is now a double survivor of the Holocaust and of the largest attack on Jews in American history. 123shirt.com will continue the “Stronger Than Hate” fundraiser indefinitely. The Barasch family has continued its community support efforts by offering temporary employment to federal furloughed employees in the Pittsburgh area affected by the government shutdown. The employees have helped to print continuing orders for the “Stronger Than Hate” shirts, allowing them to earn extra income and work part-time. The entire Barasch family—Larry and Anne, and their three children, Rachael, Michael and David—are Penn State alumni, graduating between 1978 and 2012. Larry (trumpet), Michael (trumpet) and David (sousaphone) were also all members of the Penn State Blue Band. Left to right: Lex and Zeke Winitsky (grandsons of Judah Samet), Judah Samet, Larry Barasch, Rabbi Jeff Myers (spiritual leader at Tree of Life), Anne Barasch, David Barasch (behind Judah Samet is his daughter, Elizabeth Samet). Widely acknowledged as one of the top Architectural Engineering programs in the world, the Penn State AE Department is dedicated to providing outstanding academic excellence to all of our students. The AE program is focused on preparing students and conducting research in the design, engineering, and construction of building projects.